Peter J. Tomasi talks 'House of Penance,' the horror of gun violence and more at NYCC 2017 – AiPT! Peter J. Tomasi is currently the writer of Superman (with co-writer Patrick Gleason) and Super Sons, two titles from DC Comics that not only explore father-son relationships from a similarly superheroic lens as his previous Batman and Robin run (another excellent collaboration with artist Gleason), but emphasize hope, optimism, and timeless themes of morality and responsibility in ways that only superhero comics can. To fans of those titles, Tomasi’s six-issue miniseries House of Penance, now available in trade paperback from Dark Horse Comics, may come as a surprise. 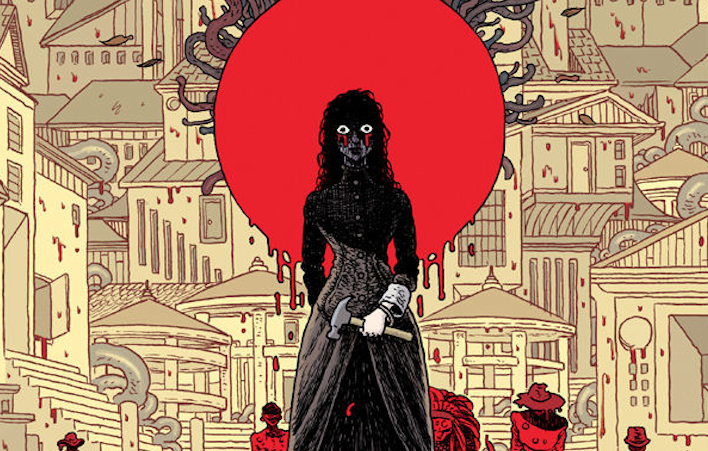 A bloody, bleak, and deeply psychological horror story with art by Ian Bertram, colors by Dave Stewart, and letters by Nate Piekos of Blambot, it deals mostly in shades of gray as Tomasi and company tell the story of the Winchester House, where, during the turn of the 20th century, men hammered away day and night to appease Sarah Winchester, haunted by the spirits who had fallen victim to the guns that her family made famous. While fantastical, it’s a story grounded in history and made all too relevant by recent events in Las Vegas, Orlando, and far too many other mass shootings to count. House of Penance doesn’t shy away from exploring these themes, and neither did Tomasi himself when AiPT!’s Gregory Paul Silber caught up with him at New York Comic Con to discuss the project’s origins, storytelling techniques, and more. AiPT! : You’re writing Superman twice a month [with co-writer Patrick Gleason], you’ve done a lot of superhero comics, and there’s a kind of hopefulness that’s inherent with the genre. Going from that to horror — straight-up, no-holds-barred horror — what was that like for you, as a writer? Peter J. Tomasi: It was a…I’m not going to say it was a nice change of gears, but it was what you would definitely say is a different change of gears. As a storyteller, you really sort of want to be able to branch out; I know I do. I like to work in a lot of different genres, because that’s the stuff I grew up on. I love sci-fi, I love horror, I love pure action movies, I love superheroes, I love straight dramas. It’s a question of…when you enjoy music, you know, I love classical, I love rock, I love some rap, so just being someone who could enjoy all different genres, as a writer, makes me feel like I like to write as many different genres. And horror, especially when you team up with the right artist, can be pretty damn cool. AiPT! : And you had a hell of an artist with Ian Bertram. Tomasi: Yeah, he’s an amazing talent. Luckily I found him for this. John Arcudi, a good friend and also an awesome writer in his own right, said “hey you should check this guy out on Bowery Boys,” and it was a book he was doing, and I was like “wow this guy’s really good. I could see him doing House of Penance.” I saw some samples, we went to lunch, and it was just amazing. He had a book, this sketchbook of just creepy stuff, and it just blew me away, and I couldn’t wait to see him start to work. You know, when you’re a writer, and you’re secluded all the time, and then you start to get pages in from your artist starting to bring your story to life, it’s like Christmas Day, every day, just seeing those pages come in. So it’s been great. He’s a great artist to work with. AiPT! : Speaking of Ian Bertram being a great artist, there’s a lot of abstraction in the way this story is told. There are a lot of moments where you think something is happening, just based on the visuals, and then you’ll turn the page and something completely different is the reality. So having that sort of abstract story, what was it like to write and translate that idea to an artist? Tomasi: It was actually relatively simple. It was really about, once you’ve got your structure and know your story, it allows you to know how to break it properly, so when you go between what looks real and what is real, you have a pure structure that allows you to really define what you want to do in a way that keeps people off balance, if that makes any sense. AiPT! : Oh, it makes perfect sense. Tomasi: With Ian, you know, I would be very clear to know that “is this happening, is it not happening?” He would know when stuff was real and when it wasn’t real. The thing we wanted to do with the book is, we want them to walk away not knowing what’s real and what isn’t real. It was a real fine line to walk, but in the end after reading it all when it came out, after I had stepped away from it for a while, I was like “wow, you know we really pulled it off.” A lot of the reviews and the readers were like “I never knew what was real and what wasn’t,” it kept everybody on their toes and we enjoyed that. Tomasi: That’s one of my pet peeves is like, people walk into movies or comic books and they kind of want to feel sedated, they want to feel comfortable, and know every story beat or feel like they know what’s coming around the corner. And it’s like, why? Why would you want that? Why would you want to sit there and not be surprised at every minute, at every turn of the page. I’d rather not. I’d rather be standing on quicksand than kind of knowing as a reader or a watcher, than standing on concrete and knowing every beat that’s coming, right before it happens. Tomasi: Well it’s never going away, obviously, right? It’s been since guns were invented, and until…honestly? When we wipe ourselves out, guns are going to be around, and they’re either going to be used for good, or they’re going to be used for evil. You know, the founders were a whole different kind of thing. I saw this video on YouTube the other day, or it was on Twitter, and they showed a guy loading a flintlock, and then they showed, obviously, the difference in slapping in another mag full of like 30 rounds, and it’s like “is this what the founders had in mind?” And it’s funny, when you see it in that context, and you see somebody take two minutes to load a breach-loading rifle, it’s kind of interesting to watch. And then to see the differences…in the horrible kind of stuff that happened in Vegas, and obviously all the other recent mass shootings. Unfortunately, I hate to say it, but it’s a timely story that will be timely forever. I think you could pick this up, unfortunately, ten years from now and I have a feeling we’ll still be in the scenarios that we’re in now. AiPT! : That kind of political exploration, was that something you wanted to be at the forefront? Tomasi: I didn’t pound the soapbox, I kind of let the characters, and the story of the guns themselves do the talking, and the people who were there for the redemption, to let them be the ones doing the talking. Yeah, I didn’t want to take a pure, non-gun gun stance, you know? I own a gun…when you’re buying guns that are fully automatic, or making them become automatic, it’s the difference between having a shotgun at home and having 20 automatic rifles. It gets a little crazy sometimes, obviously. AiPT! : Speaking of the sort of gray area of leaving it up to the reader to see how they feel about, for lack of a better word, the politics of the story, there are a lot of morally gray characters in the story too. How does that compare to some of the other characters that you’ve written? The superhero genre is known for sort of black-and-white morals sometimes. Tomasi: Well this is real world, this is gray. There’s no black and white. There’s killers, there’s saviors, there’s people drenched in blood that are looking to wash it off. And then there are other people who can’t ever wash it off, and obviously still keep going — the violence keeps going. AiPT! : This takes place at a very interesting time in American history: not too long after the Civil War, there’s still a lot of, obviously, racial tension going on, all sorts of remnants of that period. What was it about that setting, and that time period, that was so interesting to you? Tomasi: Well the story took place during that time, so that was sort of the hook, obviously. But when you look at that period, like you just said, it’s a turning point in American history. The World Wars haven’t started yet, everything’s sort of ramping up, warfare’s going to be completely different, come, you know, come 1914, right around the corner when the story starts. It was a watershed moment. Weapons were suddenly… the days of charging hills were a lot different, from colonials to charging machine guns behind German lines. It was a whole new type of warfare, and obviously a whole new type of killing, which ended up spilling a lot more blood.